April 3, 2015, 10:58 a.m.
Are you one of those who’s argued an “iTunes for news” model could rebuild newspapers’ business model? Look to Canada for a paper that’s going to give it a go. By Joseph Lichterman @ylichterman April 3, 2015, 10:58 a.m.
It’s an idea that’s been discussed around the news business for years: an iTunes for news. Might readers be willing to pay for news by the article, through micropayments, much as music listeners began buying individual songs through Apple’s marketplace? The metaphor’s always had its problems. An individual song can be listened to dozens of times; a news article is generally only read once. Before you decide whether to buy a song, there’s a good chance you’ve either heard it somewhere else (the radio, YouTube) or that you know the artist; a news story is a classic experience good, where it’s hard to judge its quality until after you’ve already consumed it. And in the years since people started wishing for an “iTunes for news,” iTunes itself hasn’t done so hot, losing major ground to monthly-subscription streaming services like Spotify — an area Apple’s moving toward. But North America is about to see a version of the micropayments model tested. The Winnipeg Free Press plans to roll out a new paywall model later this month that will charge readers 27 cents ($0.21 U.S.) for every Free Press article they read. Users will also be able to buy a full digital subscription for $16.99 ($13.47 U.S.) per month, and readers who subscribe to the print or e-edition of the newspaper will get unlimited online access. New signups get a 30-day free trial. 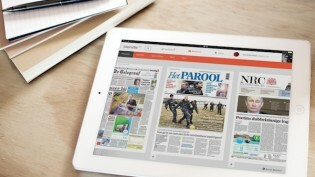 A handful of outlets, most notably the Dutch startup Blendle, have implemented a pay-per-article model, but the Free Press says it’s the first North American newspaper to adopt a pay-as-you-go setup. “We wanted to come up with a system that would avoid some of the problems we’ve seen in other systems — but more accurately, come up with something that works,” Free Press editor Paul Samyn told me. Led by The New York Times — which finished 2014 with 910,000 paid digital subscribers — many North American newspapers have adopted metered paywalls in recent years. Those generally allow free access to articles until an individual reaches a set cutoff point — say, 10 articles in a month. Then the newspaper pitches a paid digital subscription. But many have argued that the Times and other metered publications are approaching the limit of readers who are willing to pay for access above the threshold of what they get for free each month. In 2011, the Free Press introduced a metered paywall for readers outside of Canada. In 2014, the Free Press’ parent company, FP Newspapers Limited Partnership, which also owns a few smaller newspapers in Manitoba, had digital revenues of $3.85 million ($3.05 million U.S.), an increase of about $400,000 ($317,000 U.S.) from the year before. With the introduction of its new paywall, the company said it expects overall digital revenue (mostly from advertising) to increase 10 to 15 percent in 2015. The Free Press says it’s optimistic that its approach will be a more effective way of drawing in less devoted readers who might not normally pay for online news and only consume a handful of articles. “A huge swath of casual” Free Press readers consume 15 articles per month on average, according to an internal Free Press analysis. Under the new system, a reader would pay $4.05 for 15 stories per month, which is “an amount we figure will compare favourably to other options from competing paid websites,” Samyn said in a column announcing the changes. Think of it in the context of the broader shift of newspapers relying more on readers than advertisers for revenue. 27 cents an article from readers drives as much revenue as a $270 CPM for digital advertising would — and newspapers are earning nothing near that from ads. But you only get that 27 cents if readers are willing to pay it; the psychological hurdle of each click coming with a pricetag is high. Some of those casual readers will be upsold to a full digital subscription; some will pay by the article; and some will refuse to hand over a credit card and simply find their Manitoba news elsewhere. The ratio of those three groups will determine if this model works; it’s hard to imagine a scenario where site traffic doesn’t drop substantially. Though the paper hasn’t yet started charging for its content, it’s already requiring all users to create an account with the site. (You have to register even to read the article describing the paywall.) Once the wall is live, anyone who wants to read a Free Press story will be required to have a credit card attached to that account; the idea is that by forcing users to create accounts now it will make the transition easier down the road. Aside from the business case, creating a system that requires all your readers to be logged in to an account opens up editorial possibilities. The Free Press plans increased personalization on its site: If you read a lot about the Winnipeg Blue Bombers, or are only interested in the city’s ongoing fight to control its gopher population, the site should recognize that and promote stories that suit your interests. If you visit the site multiple times a day, it’ll move stories you’ve already read further down on the homepage, replacing them with new stories that you haven’t read. Additionally, if you’ve already paid your 27 cents to read a story, the Free Press won’t charge you again if that story has been updated with new information. Why 27 cents, anyway? The Free Press had a committee that looked into how much to charge for a story, and it settled on that odd total after surveys (and anecdotal research) found that that price point “doesn’t sound too high or too low,” Samyn said. “We settled on two bits plus two cents as the Goldilocks pricing point we hope will be just right,” he wrote. Still, he added, that the 27-cent price point is just a starting figure. Once the micropayment system is in place, the paper could introduce dynamic pricing that would charge readers less for things like the weather report and more for an investigative piece that took months to report. The Free Press will also offer readers a refund if they’re not satisfied with an article they paid for. Samyn said the Free Press was influenced by Blendle — the startup from the Netherlands that’s collected content from major Dutch publishers and a growing list of English-language publications — and how it used a money-back guarantee as a way to soothe readers’ fears about paying for news. The Free Press is approaching it the same way. “We want you to have the confidence to come to the Free Press,” Samyn said. Whenever newspapers introduce a hard paywall like this one, readership usually dips, and the Free Press is expecting its traffic to drop once it introduces its paywall. But Samyn said the paper is confident it will also gain readers from the competing Winnipeg Sun (whose parent company is in the process of selling its newspaper holdings) and the Canadian Broadcasting Corporation (cutting back on its local news coverage). “We have a great responsibility to serve our city and our province,” he said. 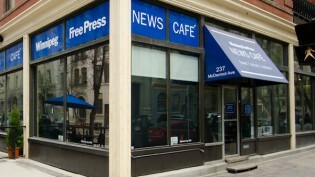 Photo of the Free Press’ downtown news cafe by AJ Batac used under a Creative Commons license. POSTED April 3, 2015, 10:58 a.m.
Lichterman, Joseph. "The Winnipeg Free Press is launching a paywall that lets readers pay by the article." Nieman Journalism Lab. 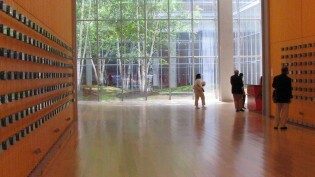 Nieman Foundation for Journalism at Harvard, 3 Apr. 2015. Web. 19 Apr. 2019. Lichterman, Joseph. 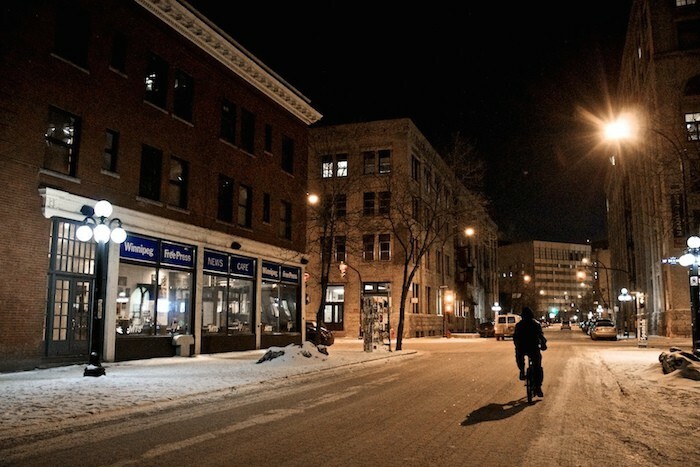 "The Winnipeg Free Press is launching a paywall that lets readers pay by the article." Nieman Journalism Lab. Last modified April 3, 2015. Accessed April 19, 2019. https://www.niemanlab.org/2015/04/the-winnipeg-free-press-is-launching-a-paywall-that-lets-readers-pay-by-the-article/.